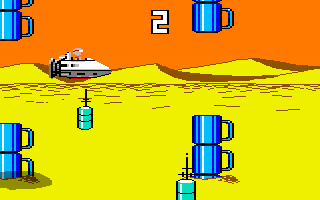 Adaption of Flappy Bird using Space Quest I graphics and blue cups. "A Flappy Bird clone that manages to better the original in every way." The parallax effects really adds a lot to the graphisms and playability, therefor the screenshots aren't reflecting the beauty of the background desert.